AquaMax Omnivorous Species - Catfish and Tilapia are the major species for this category of diets. These two species do not require the protein levels nor the nutrient density of carnivorous fish, but do require more moderate amounts of nutrients. Omnivorous species are usually warm water fish. 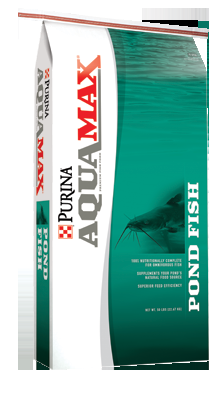 AquaMax brand fish diets are a new line of 100% nutritionally complete diets that have been collaboratively developed by fish nutritionists and experts. These products have been formulated for optimum nutrient delivery to a wide number of fish species. With complete nutrition fish, have better performance and maintain good health and resistance to disease. Aqua Max products are formulated to be high-energy, nutrient dense diets. © 2019 County Line Feed & Supply. All rights reserved.